Apple iPad provide grand big screen viewing pleasure for surfing the internet. 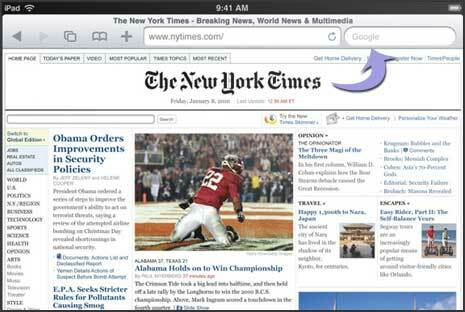 You can use Safari app on Pad to browse any website. To get specific results, you can use integrated Search feature in Safari browser on Apple Ipad. By default, Safari searches web using Google Search engine. 1. Tap on Safari icon on the Home screen of iPad. 2. Then tap search field located at top right part of Safari interface. 3. Type word or phrase for searching & tap search. It will show search results powered by Google Search. You can change the default search engine on iPad by going to Settings > Safari > Search Engine, then tap on Yahoo to switch from Google to Yahoo search. Also, after searching and web browsing you can easily delete internet history, cookies from Safari on iPad.